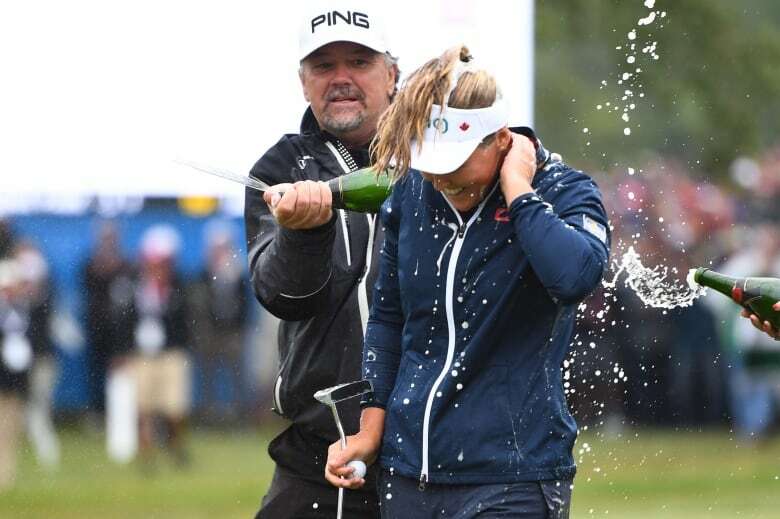 By firing an emphatic final-round 65, 20-year-old Brooke Henderson secured her place in Canadian golf history and snapped a 45-year-drought for her country on Sunday at the CP Women’s Open in Regina. REGINA — The long drought was ended in a prairie rain storm. Oddly fitting, no? 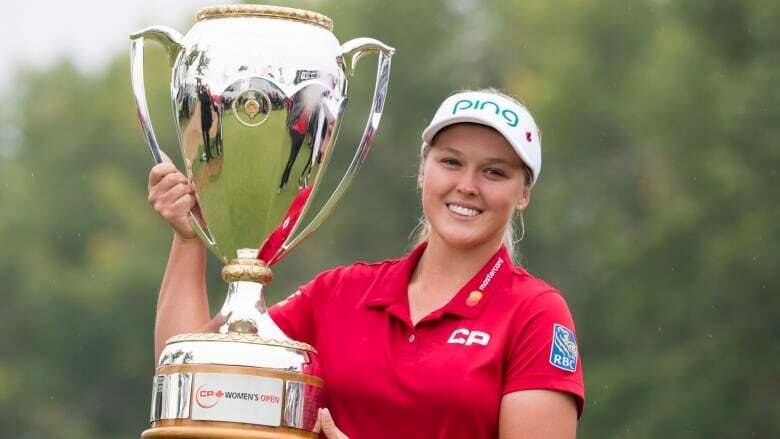 Brooke Henderson's victory on Sunday at the CP Women's Open at Wascana Country Club ended a 45-year run of Canadians finishing outside the winner's circle since Jocelyne Bourassa's victory at La Canadienne in 1973. "I always dreamt of doing this, but I didn't know if it would ever happen," said Henderson on the 18th green, letting her guard down a bit — not to reveal doubt, necessarily, but to acknowledge how much of a Herculean task it was to win the national championship. This was no tepid performance. Henderson fired a seven-under-par 65 for a four-round number of 267 (21-under) — an unbelievable score given the varying scoring conditions and the hoopla that surrounded her all week. Henderson started the week as the tournament's starlet and became its unquestioned star. Her face adorned everything from hotel key cards, to fan shuttles, to downtown signage in this prairie city. "I'm now the national champion and that's pretty cool," she said, two weeks short of her 21st birthday. Henderson started the day with a one-shot lead and though she was once tied early on, she snatched back the momentum soon after. In a sport famous for its heartbreaks, including a few with a Maple Leaf attached to them, Henderson played the back nine as though she was taking a leisurely stroll in the Regina rain. The chase pack included Angel Lin, a 19-year-old from Monterrey Park, Calif., who was playing with Henderson in the final group. Yin, a Solheim Cup champion from last summer, did her best to keep her playing partner in sight but Henderson seemed to barely notice. Yin made three straight birdies on the back nine. "I put up a good fight, I got it going but Brooke was playing extremely well," said Yin. "I gave it my best." Playing a hole ahead of Henderson was Su Oh, an Aussie upstart, who made eagle on the par-5 14th to get it to 15-under. The chase pack grew, sure, but there was no catching Henderson. Oh eventually tied for fourth, seven shots back of the winner. Hindsight can sometimes be bent to fit certain narratives but there was a degree of destiny to Henderson breaking the 45-year hex since Bourassa's victory. She first burst onto the scene as a 14-year-old when she won a Canadian Women's Tour event against a field that included this country's best female players and a handful of LPGA veterans. And while it may sound odd to say that a young kid was on a long journey, the six years that followed her first star turn on the national stage followed a steady path. It hasn't all been champagne and lollypops — there were whispers that she should be higher on the world rankings and a bit more accommodating to fans and media when things weren't going well, for example — but for the most part the plucky kid grew into a business-like champion before the country's eyes. It was also an emotional ride in both the long view and the short one. Henderson fought back tears during her trophy presentation and later when she talked about her grandfathers, who both died this summer. There were more than a few tears from others — Golf Canada officials could be seen crying after her win and Canadian Golf Hall of Famer Gail Graham, doing the network broadcast, was a teary-eyed picture of joy as Henderson putted out. Everyone seemed to understand the significance of what Henderson was doing. As she walked up 18, a flock of Canada geese took flight but gave the 18th fairway a wide berth — it was like the birds didn't want to soil the moment. What an incredible moment for golf in canada. The extra pressure that comes with playing at home can be difficult to handle but you crushed it! One of us had to win on home soil first! Congrats <a href="https://twitter.com/BrookeHenderson?ref_src=twsrc%5Etfw">@BrookeHenderson</a>!! Sunday's victory was Henderson's seventh, including a major championship won two years ago at the KPMG Women's PGA Championship. Sandra Post won eight times, a major included, but women's golf is a far different animal now. There is little doubt that Henderson's achievement has now put her on her own level among Canadian women — one that is now approaching Mike Weir's eight PGA Tour titles, Masters included, as the best golfer this country has ever produced. "It can be easy in this country to make a hockey comparison," said another Canadian Hall of Famer Lorie Kane, who came close twice in this tournament. "But what Brooke did today was like my Toronto Maple Leafs winning the Stanley Cup." That's a picture that may grate for some, but consider this one: large groups of fans lingered on Sunday, including many kids waiting to get a glimpse of Henderson. A group of young boys, previously clad in Rider green, shed their jerseys to put on "Team Henderson" t-shirts. There was a new national hero in their midst.